Just as state transportation officials are preparing a call for bids to rebuild Interstate 395 as an elevated span with a soaring “signature bridge” over Biscayne Boulevard and park space beneath it, civic leaders aiming to create open urban space around the adjacent Arsht Center have done them one better. On Thursday, they released a fleshed-out conceptual design for an expansive new park and plaza that would provide a new civic frontispiece for the Arsht’s opera and ballet house. The plan includes an interactive water feature beneath the new bridge and a compact but full-blown hardwood hammock forest on the south side. 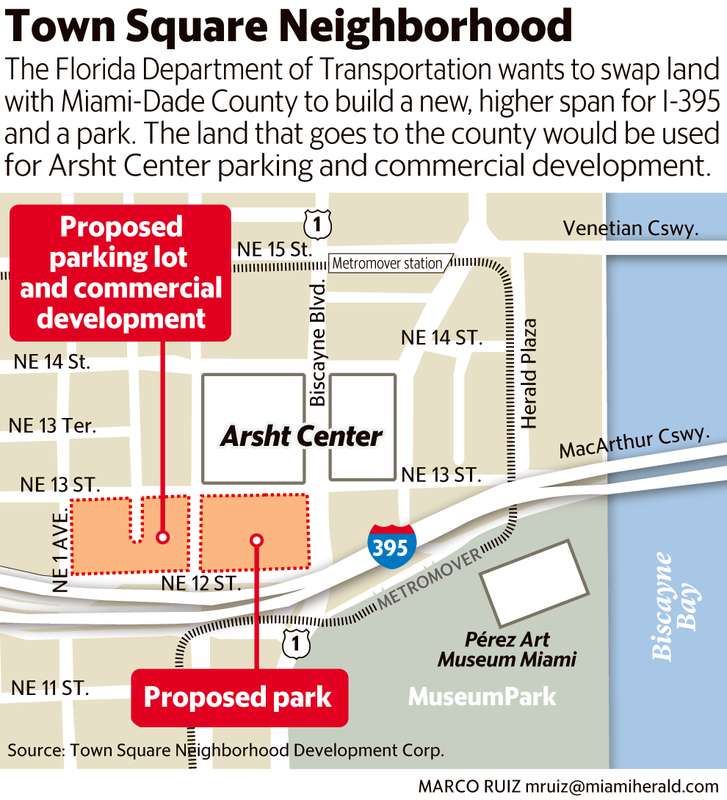 al of the I-395 scheme: to appealingly connect the Arsht at ground level with the rapidly redeveloping north end of downtown Miami on the south side of the roadway. 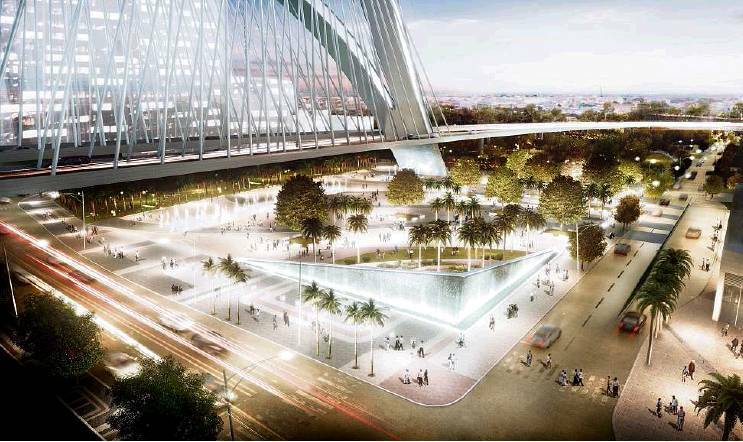 Those areas have long been separated by the highway’s massive embankments, while the existing bridge, a low forbidding span, discourages pedestrian traffic and visually cuts off the Arsht from Museum Park and downtown. FDOT is holding a Feb. 2 forum for prospective bidders and plans to issue a request for proposals shortly afterward, said Tasha Cunningham, an agency spokeswoman. The bid request, which seeks a firm that would both design and build the new roadway, emphasizes landscaping and public amenities under the elevated span. The state budget does include money for those improvements, she said. While FDOT officials had not seen the Town Square plan until Thursday, Cunningham said, the park idea is “very similar” to FDOT’s concept. The plan’s release comes as the Miami-Dade Commission is scheduled on Tuesday to consider a land-swap with FDOT that would give the state agency control of the county-owned parking lot property just south of the Arsht’s ballet-opera house, for use in the I-395 project. The FDOT plan calls for building a new elevated span just north of the existing highway, which would move the expressway closer to the opera house’s front door. The old span would then be torn down. In exchange for its land, the county would cede to the state a property of equal size and value immediately west of Northeast Second Avenue from the lot it needs. The Arsht would then build a long-needed parking garage on that property, Fein said. The Arsht is exploring several financing options that don’t require county funding for the garage, which would incorporate commercial space, he said. He declined to reveal specifics. The contemplated Town Square Plaza would stretch from the ballet-opera house south, replacing the existing parking Lot C, and extend under and just south of the new I-395 span, for a total of just under five acres. Designer Juan Mullerat said the park would comprise four sections. A tree-shaded plaza fronting the Ziff Opera House could serve double duty as a valet-parking lot during performances. A wedge-shaped fountain would frame the park’s northeast corner, enclosing a simple outdoor amphitheater. Cascading water would mask the sound of traffic from Biscayne Boulevard and I-395, Mullerat said. Interactive fountains and water features would provide a children’s play area under the new bridge. On the south side, the plan envisions a dense hardwood hammock, turning what’s now unused land under the existing span into the only natural habitat for native trees and plants in downtown Miami, he said. The park would also protect open views to and from the Arsht Center’s two buildings, which will be increasingly hemmed in by massive slabs of planned condos of up to 60 stories to its north and west. Though Town Square previously issued a proposed master plan that called for buildings no taller than 10 stories and a series of green open spaces around the Arsht, and developers have met with its officers, they have opted to build what’s allowed by the city’s Miami 21 code, Fein said.